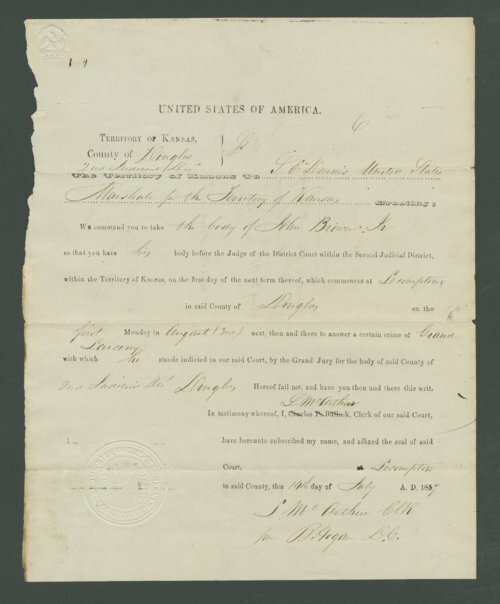 Materials relating to the case of the Kansas Territory, U.S. District Court versus John Brown, Jr., on the charge of grand larceny for stealing a horse from George R. Hopper on May 23, 1856 in Lykins County, Kansas (now Miami County). Second District Judge Sterling G. Cato issued a subpeona for the testimony of Thomas Kelly, Charles A. Foster, Samuel M. Merrill, Joseph B. Higgins, William Collis, Harvey Jackson, and William Chestnut.